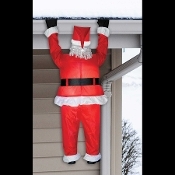 This funny life size realistic indoor outdoor Airblown inflatable roof hanging Santa Claus is sure to get a laugh from all your neighbors, friends and holiday guests. Santa is 6.5-feet (192.5cm) tall. He lights up, self-inflates in seconds, and comes with everything you need for set-up, including the fan and the hanging hardware for attaching him to your home's gutters or roofline. *We recommend adding your own heavy-duty clamps if you are in a windy area, to prevent loss or damage. Made of weather resistant poly nylon fabric for durability. Fun Christmas holiday prop yard decoration is suitable for indoor or outdoor use and plugs into any standard 110 USA 120v outlet. Deflates for easy storage. Detailed instruction sheet included. Includes: Tethers, Stakes, Fan, Lights. *International locations outside the USA will require an adaptor, NOT included.